If you don’t know Bob Mankoff, reading his memoir, How About Never — Is Never Good For You? 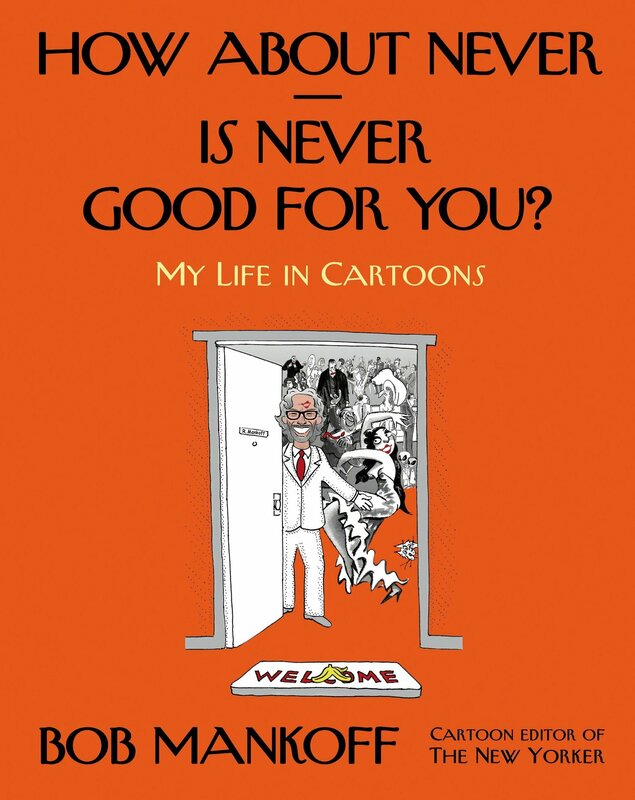 : My Life in Cartoons (Henry Holt, 2014), will be a glorious case of friends-at-first-sight. That’s his cheery cartoon self beaming out from the front cover there, and he’s welcoming you to the wittiest party in town: the world of the New Yorker‘s cartoon department. Inside, there’s space for aspiring cartoonists to add their name to the list of dedicatees (a roll-call of every artist ever published in the magazine), while the flap copy promises “732 FOOLPROOF SECRETS TO WINNING THE NEW YORKER CAPTION CONTEST!” It’d be crazy to forgo such hospitality. And as a cartoonist who’s overseen the publication of fourteen thousand New Yorker cartoons — and contributed more than nine hundred — Mankoff is very well placed to show us what he calls “the soup-to-nuts process of cartoon creation, selection, editing, and publishing”. Although billed as a memoir, How About Never is as much a tribute to the art and practitioners of cartooning, and Mankoff devotes generous space to the words and pictures of his colleagues. Raised in the Bronx and Queens, Bob is the son of Mollie and Lou Mankoff, who sound a bit like a nicer version of Alvy Singer’s parents in Annie Hall. Mankoff’s lifelong love of wise-cracking dates from a childhood trading insults with his Jewish friends and emulating Jerry Lewis. He finds a talent for drawing early on. Electing to study at the High School of Music and Art, he’s relieved to be able to dedicate himself entirely to the latter “because while I could draw a wheelbarrow, I couldn’t carry a tune in one.” A later interest in psychology nearly bagged him a PhD from CUNY and though giving up academia for “cartoonology” wasn’t angst-free — his mother would now never be able to refer to “My son, the doctorate!” — it would pay off in the long run. He marries — three times — but after the first few chapters, Mankoff doesn’t really dwell on the personal. What he offers up instead is a masterclass in his art and an inside account of America’s most idiosyncratic national publication. all I had to show for it were enough New Yorker rejection slips to wallpaper my bathroom. Undaunted, and financially sustained by the sales to other magazines, I kept at it. Besides, I had other rooms that needed wallpaper. Gradually, rejection turned to acceptance. There’s a nice section where other cartoonists who joined the magazine at around the same time as Mankoff — Roz Chast, Michael Maslin, Jack Ziegler, Mick Stevens — discuss their first published pieces, all handsomely reprinted. But our new best friend is not in the business of nostalgia for the sake of; the three hundred-plus cartoons that grace his pages illustrate in more than one sense. They track social mores. They provide an insight into the mechanics of humour. They’re even a bellwether for the different editorial directions the magazine has taken. Even with these changes in course, most people know in a general sense what you mean by a “New Yorker cartoon”. Having such a defined style, though, is not without its pitfalls. Remember the Seinfeld episode “The Cartoon“? Mankoff devotes a hugely entertaining chapter to its analysis, much of which can be read in his excellent blog posts on the subject here, here, here and here (hear, hear). The cartoon Elaine drew on the show even became the subject of the caption contest in real life. This competition, one of the New Yorker‘s most popular features, has only been running on a weekly basis since 2005, but in that time there’ve been more than two million entries. Non-winning entrants include Mayor Bloomberg, Zach Galifianakis and Stephen Colbert; Roger Ebert is the only celebrity ever to have won. Side note: celebs aren’t just entering the competition. Mankoff has received unsolicited submissions from a surprising range of people including David Mamet, who wrote him when he first became cartoon editor: “I’ve taken the liberty of sending you a batch of cartoons”. “I sent a note back to him,” Mankoff remarks, “thanking him and saying I had taken the liberty of sending him a play”. Humor is the antidote to overthinking. It’s a way of saying that life is paradoxical. Humor contains contradictions; it does not resolve them but revels in them. It says that the right way to exist among the contradictions, paradoxes, and absurdities of life is to cope with them through laughter. 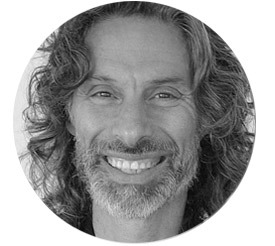 Bob Mankoff will appear at the House of SpeakEasy’s next Seriously Entertaining show, Falling For Perfection, on June 23. You can buy tickets here. Also, do check out his website, because you can see ALL of his brilliant cartoons there. Just don’t do it at work or else you might as well write off the rest of the day.